CHICAGO — You can only be a revelation once. That’s what Iowa quarterback C.J. Beathard will have to contend with in his senior season, and opposing Big Ten Conference coaches and players are already plotting against him. Last year, Beathard was unknown to most of the country, a fourth-year junior handed the reins to the Hawkeyes offense after making just one start. He had no tendencies, no minuscule flaws that Big Ten teams could tease out and exploit by watching game film. That was in the Big Ten opener, a 10-6 victory in Madison in which Beathard threw for a mere 77 yards and a single touchdown. He also had a 16-yard gain running, though, and left Shelton with some vital knowledge that he’ll use in the rematch Oct. 22 in Iowa City. Illinois defensive end Dawuane Smoot found the experience to be lacking the fun. He sacked Beathard once in a 29-20 loss the week after the Wisconsin game, but he also saw the Hawkeye quarterback slip through his grasp twice while passing for 200 yards and two touchdowns. It’s that elusiveness and ability to throw accurately on the run that makes Beathard, a second-team all-Big Ten pick a year ago, so maddening to handle, opponents say. And that’s despite the fact that he played injured in the final 12 games of Iowa’s 12-2 season, nursing a groin injury and eventually having off-season hernia surgery. Beathard says he’s 100 percent healthy, heading into the season, and he's hoping to run some more. That could be bad news for defenses, but it won’t come as a surprise this time. Beathard said Tuesday he didn’t notice teams altering game plans to try to contain him as last season wore on and more game film became available. 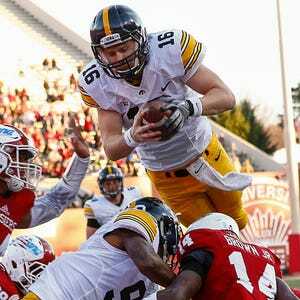 Beathard passed for 2,809 yards and 17 touchdowns against only five interceptions. He completed an impressive 62 percent of his throws. He also ran for 237 yards and six touchdowns. Iowa quarterback Chuck Long said Beathard presents defensive coordinators with their most vexing problem. “He can move out of the pocket and extend plays, especially on third down — those are the dangerous guys,” Long said. Beathard enters this season with plenty of acclaim. He is considered by many to be the best NFL Draft prospect among senior quarterbacks. He is bound to encounter more defenses designed to do what Michigan State’s did in the Big Ten championship game in December — make him one-dimensional. The Spartans sacked Beathard three times in that 16-13 victory, while he broke free for one 85-yard touchdown strike. That tradeoff was fine by them, linebacker Riley Bullough said Tuesday.